Anyone using this new product that will drop down 12 inches to attach to an inflatable? Thank you. Cannot speak for that, but I have about used every other part they sold (swivel motor mount, transom bar etc) and everything has worked as advertised and very robust construction/welds. Anyone using this new product that will drop down 12 inches to attach to an inflatable? I have no knowledge of that product but I'm seriously considering Weaver's Snap Davit System for attaching my dinghy to the big boat when in the slip. Trips to Avalon will have the dinghy on the bow. What does the TF community think of the Snap Davit System attached to the swim step? 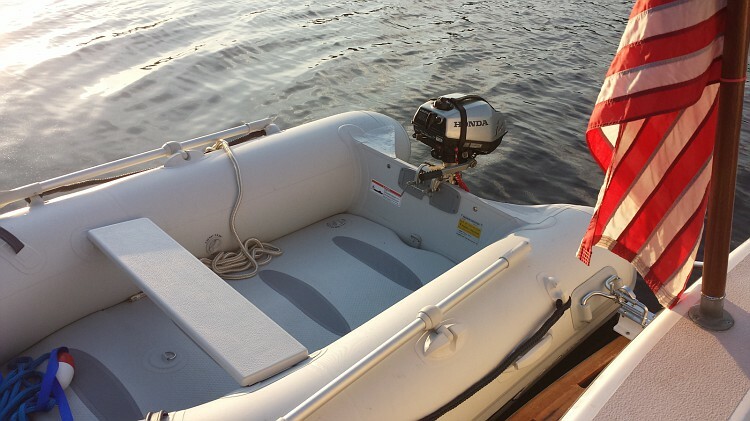 The dinghy would be more available for harbor cruising, bass fishing, restaurants, etc. If the dink is similar to the picture, then why not? The Weaver has a proven track record. You may want to think about using the removable version for the swim platform. That way the hook is gone when you don't want it. Another added feature for this is it will provide a stable parking spot for the launched dink when your cruising. I second this. 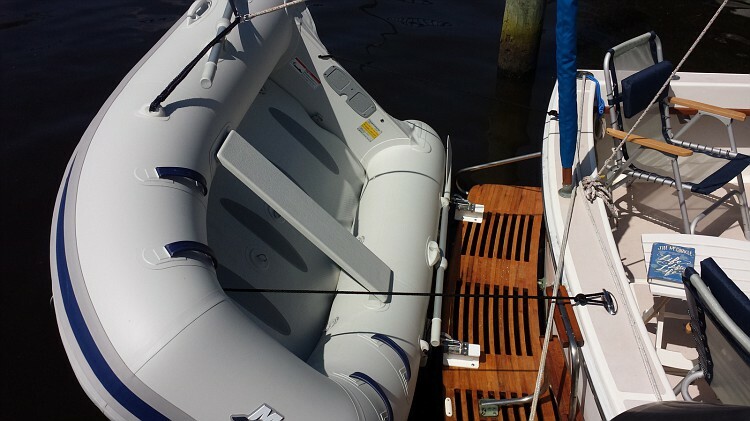 We had the same style inflatable as in the picture on our Camano with the removable Weaver system. Very stable for getting in and out. Hey I have a full set of Weaver davits along with the engine lever for sale in the classified section, just FYI. It's a deal at $795 for all of it. Just the lever new is like $670. Cramming 10 lbs of stuff into a 5 lb bag (28ft) made these a necessity..
we run with the dink fully vertical, but lower it a bit while in harbor for additional ventilation..Really easy and stable boarding and debarking also.. I've since put one of those adventure marine motor swivels on and no longer have to even remove the motor..4 pulley system makes it easy to raise/lower. I have run the snap davits on my swim platform of my old boat for over a decade. Keeps you from doing the splits when boarding & unloading groceries. makes ingress & egress from the dinghy much easier - easier to deploy than craning it down from boat deck. My guess is that you will like them. They also make it easier to load and unload dogs. They can just step over with no assistance. There you go, Walt. Problem solved. They are good. But I suggest you get the parts on the ducky professionally glued on. I has some issues with that. Hadn't thought of that! It will be great in Avalon harbor when on the mooring! I Like your new avatar, Walt. Codger looks all "bidness"!